Hobbes was adopted by Alice in November 1993. She writes, "This photo doesn't begin to do justice to Hobbes' beautiful face. He's a terrific cat - very affectionate, wonderfully behaved, amazingly expressive. Hobbes was sick when I brought him home, and it took several days before he was himself. Hobbes has plenty of windows to look out of, and he and Calvin (adopted a year before) get along very well. I'm more grateful than I can say to you and all those who do this tough work of rescuing cats." 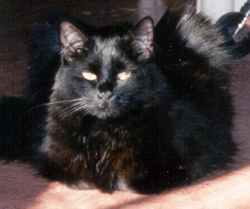 This is Paws, who was adopted as a kitten in July 1998 by Cindy, who writes, "He is the sweetest cat we have ever owned. One of his favorite things to do is to jump on your shoulders and lie down! He has adjusted well to our other two cats and the dog (actually, the dog is his best friend!) Thanks so much for all you do!" Gretchen was adopted by John and Susan in November 1997. 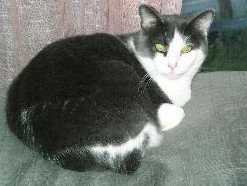 They tell us that Gretchen is "loving and affectionate, but is 'top cat' in our household." 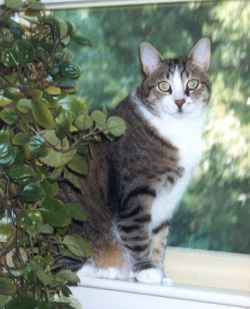 Ebie was adopted in November 1997 by Kim, who writes, "She was found with a litter of kittens, in the home of someone who was wheelchair bound. Somehow her tail had been run over and gangrene had set in. When you took her in, her tail had to be amputated immediately. I think what it was that won my heart (besides her missing tail and the story of how she'd been rescued) was the comment on the card -- "Has the sweetest little 'mew'". I held Ebie in my arms for the longest time, talking to her caretaker. I found I was absolutely unable to leave without her. 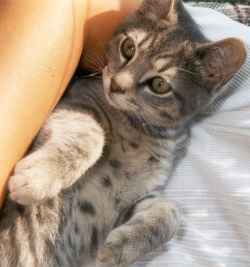 She joined Jasper and Sam as the third cat in our household." A sad update in January 2002: "Ebie passed away in the middle of the night last night. She had developed a sudden, massive unspecific infection and extreme low red blood count and, despite our vet's efforts, he was unable to save her. "We'd had her 4 years and 46 days (November 16, 1997 - December 31, 2001). We thank you so much for allowing us to adopt her and brighten our lives, even for a short time."